For current sovereign monarchs, see List of current sovereign monarchs. This is a list of currently reigning constituent monarchs, including traditional rulers and governing constitutional monarchs. Each monarch listed below reigns over a legally recognised dominion, but in most cases possess little or no sovereign governing power. Their titles, however, are recognised by the state. Entries are listed beside their respective dominions, and are grouped by country. Each major atoll in the Cook Islands has a number of arikis, ceremonial high chiefs who together form the Are Ariki, a parliamentary advisory body with up to 24 seats. The only domains not listed below are those of Manuae, on which current information is inadequate, and Penrhyn, whose chiefly line is extinct. Styles and names are listed in their conventional local form. In addition to the generic title of ariki, which is worn at the end of one's name, each chiefly line carries its own unique style, which is placed at the beginning. Thus, if the chief's name is "Henry" and his title is "Ngamaru", he is styled "Ngamaru Henry Ariki". In Fiji, which became a colony of Great Britain in 1874, the British monarchs were historically bestowed the title Tui Viti, which translates as "King of Fiji" or "Paramount Chief of Fiji". The last holder of the title (from 6 February 1952) was Queen Elizabeth II, of the House of Windsor. The state became a republic in 1987, abolishing the title by establishing a new constitution. The former Great Council of Chiefs, however, still recognised Elizabeth II as Tui Viti, as the nation's traditional queen and its supreme tribal chief, despite no longer holding a constitutional office. Consequently, while Fiji remains a republic, a monarch or paramount chief is still recognised by traditional tribal politics. The Queen has made no official claim to the Tui Viti throne, although she has remained open to the possibility of a constitutional restoration of the monarchy. Native chiefs in Fiji are considered members of the nobility. The House of Chiefs, consisting of about 70 chiefs of various rank determined by a loosely defined order of precedence, was modeled after the British House of Lords. Tongan chiefs, subordinate to a king, are also considered nobles and have therefore been excluded from the above list. In American Samoa there are 12 paramount chiefs, all traditionally subordinate to the Tu'i Manu'a, a title that is now considered purely historical; the last titleholder, Elisala, died 2 July 1909. The paramount chiefly titles are: on Tutuila, Faumuina, Lei'ato, Letuli, Fuimaono, Tuitele, Satele, Mauga, and in the Manu'a Islands, Lefiti, Sotoa, Tufele, Misa and Tuiolosega. ^ The most recent (since 31 May 1998) king, Tito, was deposed by a vote of no confidence in the Leadership Council, and was replaced (on 30 May 2004) by Valentín. The former, who is no longer in office, has disputed the legality of the deposition, and still claims the title. The new king has not yet been recognised by the government of Panama. ^ Succession is determined by the vote of the general adult population. An election for a new monarch may take place upon any occasion in which an eligible member of the royal family wishes to be considered. Until recently, the traditional law of succession followed a pattern similar to the rota system. ^ The government of the Marshall Islands recognises 12 chiefly domains, called mojen, each headed by one or several paramount chiefs. Each domain is represented in the Council of Iroij, a legislative body of traditional chiefs guaranteed by the Constitution. ^ Jurelang is also (since 2 November 2009) the current head of state of the Marshall Islands. ^ This domain covers the islands of Ailuk, Aur, Maloelap, Taongi, Utirik and Wotje in the Ratak Chain. Its ruling clan has also laid claim to nearby Wake Island, under the name Eneen-Kio. ^ This chief is normally referred to as the Isipahu. ^ The ruling line belongs specifically to the Inenkatau (or Upwutenmai) sept of the Dipwinpahnmei clan. ^ This chief is normally referred to as the Sangiro. ^ The ruling line belongs specifically to the Sounpasedo sept of the Lasialap clan. ^ Hilarion was recognised as grand chef in 1974, but, due to a violent succession dispute with his relative Jean-Marie Vendégou, was not formally enthroned until 7 July 1979. He is also the mayor of the island commune until 2014. ^ a b A Kanak dynasty. ^ The Naisseline family is a branch of the Netché, a tribe of Kanaks. ^ The throne of the grand chef on Maré Island is traditionally held by the chief of Guahma district, an hereditary position. ^ The throne of the grand chef on Lifou Island, which also rules Ouvéa, is traditionally held by the chief of Lössi district, an hereditary position. ^ Commonly referred to as the "Māori King Movement". Its elected ariki nui is often called the "Māori King" due to his nationalistic influence over all Māori tribes as a symbol of unity. This title is not officially recognised by the government of New Zealand. ^ Te Wherowhero is the lineage of the first king. It belongs to the Waikato iwi, which is part of the Tainui confederation. ^ The monarch is appointed for life by the chiefs of the tribes involved in the Kīngitanga movement. Traditionally, selection is limited to direct descendants of the first king: Pōtatau I, of the Waikato tribe. However, in principle inheritance is open to any lineage should the electing chiefs be in agreement. ^ Palau is divided into 16 traditional polities. The 16-seat Council of Chiefs, made up of the traditional chiefs from each constituent state, is an advisory body to the President. The chiefs of Koror and Melekeok, the highest chiefs from Eoueldaob and Babeldaob respectively, are recognised as the two paramount chiefs of the nation. ^ a b This is not the name of the ruling house or clan: it is the ritual name used by the successive chiefs from this lineage. ^ a b Chiefs are selected by the most senior women of the ruling clan. ^ There are four paramount chiefs in Samoa, each presiding over a royal lineage (Tama a ‘Āiga) of past kings. Chiefs are afforded considerable power. The national parliament, the Fono, is composed exclusively of chiefly titleholders (matai). The office of head of state (the O le Ao o le Malo) is traditionally reserved for the paramount chiefs, although this is not required by the Constitution. ^ Tufuga Efi has held the chiefly title of Tui Atua Fa'asavali since 1 July 1983. ^ Va'aletoa Sualauvi has been the head of state since 21 July 2017. ^ The throne of the Mata'afa has been vacant since 1997; little other information is available. ^ The throne of the Mālietoa has been vacant since 2007. The current claimant, Papali'i Fa'amausili Moli, succeeded to the throne as "Moli II" in a bestowal ceremony on 29 June 2007, but an interim order in the High Court dated 27 September 2007 prevents his use of the title. The interim order was demanded by senior representatives from the Talavou and Natuitasina branches of the clan, who were allegedly not consulted about nomination of the new titleholder. The holder of this title also wears the chiefly title of Susuga. ^ The lineage associated with this title consists of three branches: Sa Moli, Sa Talavou and Sa Natuitasina (also spelled Gatuitasina). As the succession law dictates, heirs of all three branches are equally entitled to hold the title, and accession of an heir to the title is subject to nomination and consensus from all three branches. The most recent titleholders have been from the Moli sept.
^ Each island or atoll has a traditional high chief, the ulu-aliki, who is recognised by and plays an active ceremonial role in the national government. Thrones are primarily elective, but candidates are limited to members of a number of chiefly clans. ^ Funafuti's traditional chieftaincy is limited to senior members of two chiefly clans: Te Aliki a Mua, and Te Aliki a Muli. By custom, succession rotates between the two lineages. ^ The high chief, or Pulefenua, is elected by a council of chiefs (the Fale Kaupule) from senior members of Nanumea's seven chiefly clans, all of which claim descent from the first settlers. ^ The king is elected by a council of chiefs from the senior members of the kingdom's four chiefly clans. ^ The king is elected by a council of chiefs from the senior members of the kingdom's three chiefly clans: the Tamole, the Keletaona, and the Safoka. ^ The king is elected, traditionally for ten years, by a council of ministers from the senior members of the kingdom's royal clans. These clans correspond to the three districts of the island: Hahake, Hihifo, and Muʻa. The present king is of the Hihifo clan. ^ Her full name is "Ada Teaupurepure Tetupu". ^ The two high chiefs on Manihiki also traditionally reign over neighbouring Rakahanga. They represent the populace of both islands in the area Ariki. ^ The title is also often written as Whakaheo Ariki. ^ Arikis of this line belong to either the Numatua or Tiangarotonga tribes. ^ The throne of Te Faingaitu Ariki (alternatively Whaingaitu) is vacant. It is apparently disputed between members of the eligible tribes, but no information is available on the claimants. ^ Arikis of this line belong to either the Heahiro or Mokopuwai tribes. ^ Sources are unclear on the name of the current Tamuera Ariki (often written Samuela Ariki). ^ His name is sometimes written "Te Maeva" or simply "Maeva". ^ The Makea Nui Ariki is one of three high chiefs in the Te Au o Tonga tribe on Rarotonga. The previous ariki died in 1994, and her successor has yet to be agreed upon. Several members of the tribe claim rightful inheritance of the title. Succession is traditionally limited to the Rangi Makea clan; the three other clans of the tribe (Sadaraka, Mere and Upokotokoa) are considered junior branches. Mere Maraea MacQuarrie, the youngest daughter of the last ariki, is the only known claimant from the Rangi Makea clan, and is apparently the contender most likely to be granted the title. Other contenders include Stanley Adam Hunt, Yolande Browne, and Matapo Oti Oti, all of whom claim descent from the earlier arikis. The first of these, Hunt, was "invested" with the Makea Nui title under the regnal name "Takaia Tutavake"; the ceremony, which took place 16 May 2009, was not recognised by the government. ^ Her full regnal name is "Tapaeru Teariki Upokotini Marie", most commonly known as "Pa Marie". ^ There are three separate lineages eligible for the Puaikura Royalty, all of which descend from Tinomana Enuarurutini (ca. 1820–1854) the King of Puaikura and one of his three wives. They are (in order of seniority): Te Pori a Pa, Oakirangi, and Akaiti a Rua. The current Tinomana Ariki revert to the first and only married wive "Te Pori a Pa line". ^ Jackson, Eric (6 December 2009). "Naso land claims talks appear to be designed to fail". The Panama News. Panamá City, Panama. Archived from the original on 3 January 2010. Retrieved 1 June 2010. ^ Loeak, Anono Lieom; Kiluwe, Veronica C.; Crowl, Linda (2004). Life in the Republic of the Marshall Islands. Suva, Fiji: IPS Publications, University of the South Pacific. p. 20. ISBN 978-982-02-0364-8. ^ a b Cahoon, Ben. "Marshall Islands Traditional Polities". World Statesmen.org. Retrieved 13 June 2010. ^ Johnson, Giff (25 November 2010). "Huge funeral recognizes late Majuro chief". Marianas Variety. Majuro: Younis Art Studio Inc. Archived from the original on 14 July 2011. Retrieved 29 November 2010. ^ Jaynes, Bill (17 February 2010). "PRC Ambassador Zhang Weidong turns over Pohnpei State Government building to the FSM". Kaselehlie Press. Peilapalap, Pohnpei. Retrieved 14 June 2010. ^ Riesenberg, Saul H. (1968). "The Native Polity of Ponape" (PDF). Smithsonian Contributions to Anthropology. Washington, D.C.: Smithsonian Institution Press. 10. Retrieved 13 June 2010. ^ "President Nena Was Bestowed Traditional Title" (Press release). Government of the Federated States of Micronesia. 20 November 1997. Retrieved 14 June 2010. ^ Godard, Philippe (1980). Le mémorial Calédonien, Volume 8: 1970-1981 (in French). Nouméa: Art Calédoniennes. pp. 43, 60, 101. ^ Staff (7 June 2007). "Grand chef à 33 ans". Les Nouvelles Calédoniennes (in French). Maré, New Caledonia. Retrieved 14 June 2010. ^ "Lifou". Genealogical Gleanings. Henry Soszynski, University of Queensland. Archived from the original on 13 June 2011. Retrieved 12 June 2010. ^ Staff (21 August 2006). "New Zealand Maori choose new king". BBC News. Retrieved 12 June 2010. ^ "Ngati Tuwharetoa". Genealogical Gleanings. Henry Soszynski, University of Queensland. Archived from the original on 10 March 2011. Retrieved 12 June 2010. ^ Cahoon, Ben. "Traditional chiefs of Palau". World Statesmen.org. Retrieved 13 June 2010. ^ "Koror, Palau". Almanach de Bruxelles. 2003. Retrieved 14 June 2010. ^ "Melekeiok, Palau". Almanach de Bruxelles. 2008. Retrieved 14 June 2010. ^ "Tupua Tamasese". Genealogical Gleanings. Henry Soszynski, University of Queensland. Retrieved 18 June 2010. ^ "Tuimaleali'ifano". Genealogical Gleanings. Henry Soszynski, University of Queensland. Retrieved 18 June 2010. ^ "Mata'afa". Genealogical Gleanings. Henry Soszynski, University of Queensland. Retrieved 18 June 2010. ^ "Malietoa". Genealogical Gleanings. Henry Soszynski, University of Queensland. Retrieved 18 June 2010. ^ Government of Tuvalu; Ministry of Finance, Economic Planning and Industries; Economic Research and Policy Division (November 2005), "Malefatuga Declarartion", Te Kakeega II: National Strategies for Sustainable Development: 2005–2015 (PDF), Funafuti: United Nations, p. 27, retrieved 14 June 2010 CS1 maint: Multiple names: authors list (link). ^ Faaniu, Simati (1983). Laracy, Hugh (ed.). Tuvalu: A History. Suva, Fiji: IPS Publications, University of the South Pacific. ^ Cahoon, Ben. "Wallis and Futuna Islands". World Statesmen.org. Retrieved 28 April 2010. ^ "Sigave, Wallis & Futuna". Almanach de Bruxelles. 2009. Retrieved 28 April 2010. ^ Soszynski, Henry. "Wallis". Genealogical Gleanings. University of Queensland. Archived from the original on 13 June 2011. Retrieved 28 April 2010. ^ a b c d "Female Head of State of the Cook Islands". Worldwide Guide to Women in Leadership. Christensen, Martin. Retrieved 18 June 2010. ^ a b "Mitiaro ariki re-elected House president" (Press release). Government of the Cook Islands. 7 August 2003. Archived from the original on 1 October 2010. Retrieved 18 June 2010. ^ a b c d e Staff (16 June 2008). "Proclamation by the Ui Ariki". The Cook Islands Herald. Rarotonga: Cook Islands Herald Online. Retrieved 18 June 2010. ^ a b Kautai, Ngatupuna (1991). Atiu: an island community. Suva, Fiji: IPS Publications, University of the South Pacific. pp. 30–32. ISBN 978-982-02-0163-7. ^ a b Hunt, Errol; Keller, Nancy (2003). Rarotonga & the Cook Islands. Melbourne: Lonely Planet. pp. 118, 137. ISBN 978-1-74059-083-9. ^ Buck, Sir Peter Henry (1932). Ethnology of Manihiki and Rakahanga. Honolulu, Hawaii: Bernice P. Bishop Museum. pp. 28–65. ^ Moekaʻa, Moana (31 December 2009). "Oliveta celebrates centenary". Cook Islands News. Rarotonga: Cook Islands News Online. Archived from the original on 30 May 2009. Retrieved 18 June 2010. ^ Staff (23 March 2009). "All smiles at the signing of agreement by Pukapuka MP and Government". The Cook Islands Herald. Rarotonga: Cook Islands Herald Online. Retrieved 17 June 2010. ^ Greig, Helen (17 September 2009). "King meets Rarotonga ariki at Taputapuatea". Cook Islands News. Rarotonga: Cook Islands News Online. Archived from the original on 28 September 2009. Retrieved 18 June 2010. ^ Staff (14 May 2009). "Karika reign celebrated at palace". Cook Islands News. Rarotonga: Cook Islands News Online. ^ Staff (22 April 2009). "Changes to succession to Makea Nui tribal title?". The Cook Islands Herald. Rarotonga: Cook Islands Herald Online. Retrieved 17 June 2010. ^ Moekaʻa, Moana (16 May 2009). "Another makes claim for Makea Nui title". Cook Islands News. Rarotonga: Cook Islands News Online. Archived from the original on 30 May 2009. Retrieved 17 June 2010. ^ Moekaʻa, Moana (14 January 2009). "Tahiti claimant seeks title". Cook Islands News. Rarotonga: Cook Islands News Online. Retrieved 17 June 2010. ^ Staff (13 October 2008). "Makea contender wanting to rewrite history?". The Cook Islands Herald. Rarotonga: Cook Islands Herald Online. Retrieved 17 June 2010. ^ Jonassen, Jon (2007). "Cook Islands". The Contemporary Pacific. University of Hawaiʻi Press. 19 (1): 207–213. doi:10.1353/cp.2007.0017. ISSN 1527-9464. ^ Staff (20 November 2002). "Queen still chief of Fiji". The Sydney Morning Herald. Sydney: Sydney Morning Herald Online. Retrieved 18 June 2010. ^ "Fijian Chiefly Titles". Genealogical Gleanings. Henry Soszynski, University of Queensland. Archived from the original on 13 June 2011. Retrieved 18 June 2010. ^ "Tongan Titles". Genealogical Gleanings. Henry Soszynski, University of Queensland. Retrieved 18 June 2010. Cahoon, Ben (2000–2010). "World Statesmen.org". Retrieved 19 April 2010. Remy, Adelin (1996–2010). "Almanach de Bruxelles". Retrieved 19 April 2010. Soszynski, Henry (1996–2010). "Genealogical Gleanings". University of Queensland. Archived from the original on 22 May 2010. Retrieved 19 April 2010. Tick, Donald P. (2004–2008). "Indonesia Pusaka". Blogger. Retrieved 19 April 2010. Tick, Donald P. (2008–2010). "Kingdoms of Indonesia (Kerajaan Indonesia)". Blogger. Retrieved 19 April 2010. Tick, Donald P. (2007–2010). "Royal Timor: Kings, Rajas and Dynasties of Timor". Retrieved 28 April 2010. Van Klinken, Gerry (2007). "Return of the Sultans: The Communitarian Turn in Local Politics". The revival of tradition in Indonesian politics: The deployment of adat from colonialism to indigenism. London: Routledge: 149–169. SSRN 1309406. The Cook Islands are named after Captain James Cook, who visited the islands in 1773 and 1777. 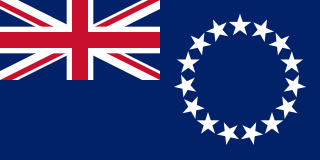 The Cook Islands became a British protectorate in 1888. The politics of the Cook Islands, an associated state, takes place in a framework of a parliamentary representative democracy within a constitutional monarchy. The Queen of New Zealand, represented in the Cook Islands by the Queen's Representative, is the Head of State; the prime minister is the head of government and of a multi-party system. The Islands are self-governing in free association with New Zealand and are fully responsible for internal affairs. New Zealand retains some responsibility for external affairs, in consultation with the Cook Islands. In recent years, the Cook Islands have taken on more of its own external affairs; as of 2005, it has diplomatic relations in its own name with eighteen other countries. Executive power is exercised by the government, while legislative power is vested in both the government and the islands' parliament. The judiciary is independent of the executive and the legislatures. The Polynesian narrative or Polynesian mythology encompasses the oral traditions of the people of Polynesia, a grouping of Central and South Pacific Ocean island archipelagos in the Polynesian Triangle together with the scattered cultures known as the Polynesian outliers. Polynesians speak languages that descend from a language reconstructed as Proto-Polynesian that was probably spoken in the Tonga - Samoa area around 1000 BC. The Kingdom of Rarotonga, named after the island of Rarotonga, was an independent kingdom established in the present-day Cook Islands in 1858. In 1888 it became a protectorate of the United Kingdom by its own request. In 1893 the name was changed to the Cook Islands Federation. The House of Ariki is a parliamentary body in the Cook Islands. It is composed of Cook Islands high chiefs (ariki), appointed by the Queen's Representative. There are up to twenty four members, representing different islands of the Cooks. Makea Takau Ariki (1839–1911) was a sovereign of the Cook Islands. She was the ariki (queen) of the dynasty Makea Nui, one of the three chiefdoms of the tribe Te Au O Tonga on the island of Rarotonga. Makea Pori Ariki was a sovereign of the Cook Islands. He was the ariki of the Makea Nui dynasty, one of the three chiefdoms of the Te Au O Tonga tribe on the island of Rarotonga. Tinomana Mereana Ariki was a sovereign of the Cook Islands. She was the ariki of the Tinomana dynasty, a chiefdom of the Puaikura tribe on the island of Rarotonga. She was the second ariki of importance and position next to Makea Takau. Numangatini Tione Ariki (b?–d?) was a sovereign of the Cook Islands. He was ariki (king) of the Numangatini dynasty, a chiefdom on the island of Mangaia. Pa Tepaeru Terito Ariki, Lady Davis was Pa Ariki, one of the two ariki titles of the Takitumu tribe on the island of Rarotonga of the Cook Islands from 1924 until 1990.